Today’s walk saw me in the Far East of the Lake District, furthermore a place of solitude far away from the crowds in a valley that possibly holds the title for one of the least visited places in the whole of the Lake District. The valley I am referring to is of course Swindale which is neatly nestled in between the sister villages of Shap and the Valley of Mardale. 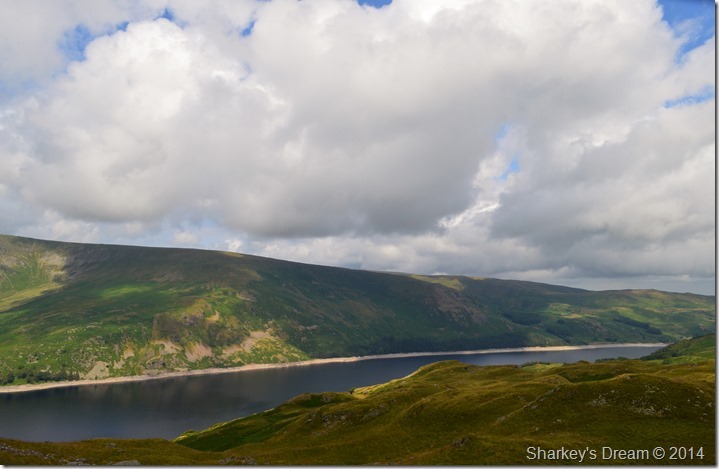 Throughout the centuries it is said that most of the towns & villages of Lakeland are pretty unrecognisable to that of the turn of the century, not Swindale who unlike its sister Valley of Mardale-just a stones throw away, has barely changed since farming in Lakeland began. 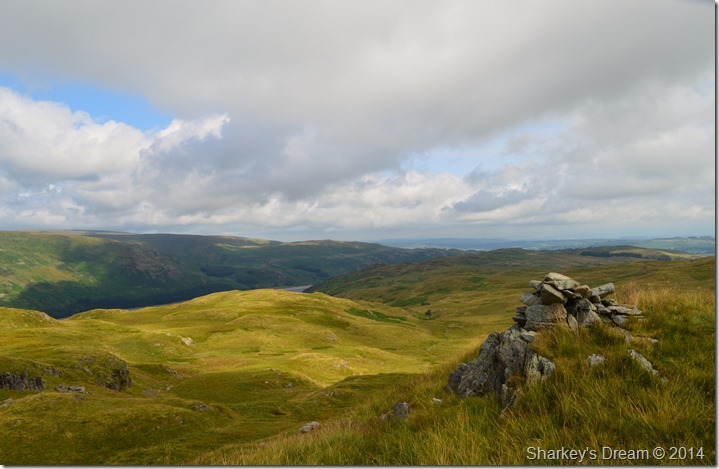 I am all to familiar with the Far Eastern fells as above all else, they are the fells I favour the most, however, todays route will see me traverse almost quite a lot of paths of which are brand new territory to this hardened fell walker. No wonder I couldn’t wait to get boot onto fellside. 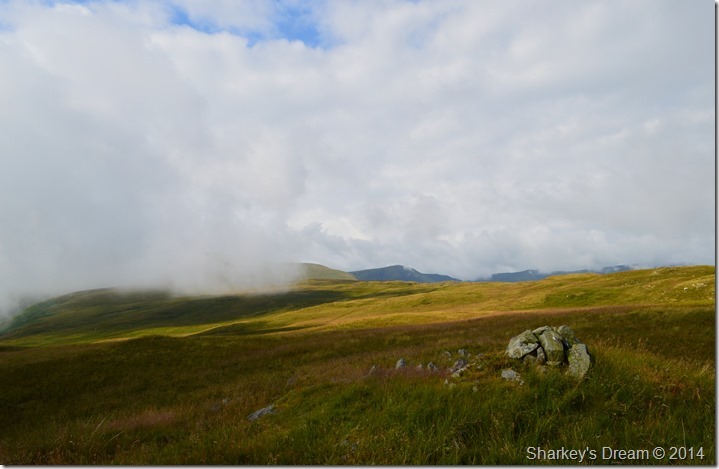 The relative inaccessibility of many of the heights (due to decided lack of tourist accommodation in the valleys) can be the only reason why they remain lonely and unfrequented by visitors, for in the high quality of the scenery and the excellence of the walks they rank with the best. 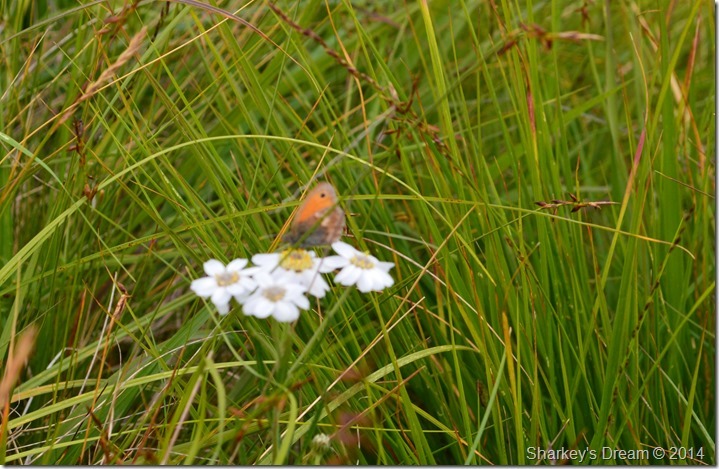 Solitary walkers will enjoy the area immensely. 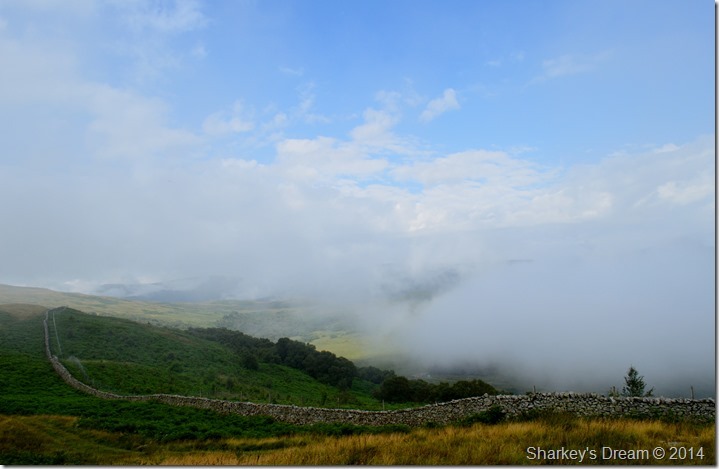 A distant Scalebarrow Knott seen through a mix of morning mist & hill fog. 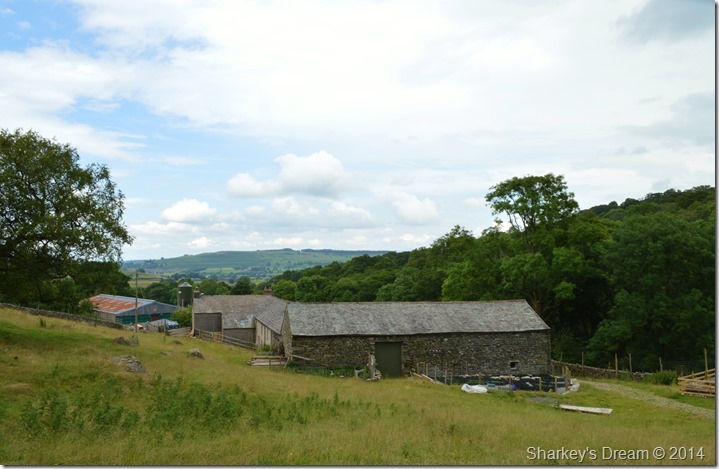 My walk started at the North Eastern end of Swindale Lane at a narrow crossroads signposted Swindale & Bampton. I couldn’t help feel a little off put however by a sizeable concrete car park that just doesn’t do the land any justice at all, I figure that the car park may have something to do with North West Utilities as they play a pretty big role here in Swindale & its adjoining valleys. It’s 07:45 & I am the first to arrive at the car park after patiently waiting for the dozens of sheep that blocked my arrival via the narrow lanes after passing through a sleepy Rossgill. Kitting up was done swiftly as I carefully eye out an area of concrete that didn’t have sheep droppings on it. Although I am in my summer attire of walking shorts & my trusty Craghoppers shirt (that has more bobbles on it than in my sock drawer) I still chose to pack my waterproof jacket as come midday there was a slight chance of rain forecast, my jacket as always, gets fastened beneath the lid of my back pack for swiftness should I get caught out. After locking the car I took on the narrow tarmac road sign posted Bampton where shortly afterwards I hooked a left & joined a farm track narrowly avoiding a early navigational error by heading towards a farm gate to my right, I only took a couple of steps towards it before realising I was heading in the wrong direction but I had figured I had my excuses as the whole area was shrouded in low hill fog. I wasn’t too sure whether it was my proximity to Scalebarrow Knott or the fact that the low cloud had ever so slightly started to lift, even so, the hill side opened up as over my shoulder a struggling sunrise tried & failed to break through the thick cloud leaving a faint afterglow in an otherwise grey sky. 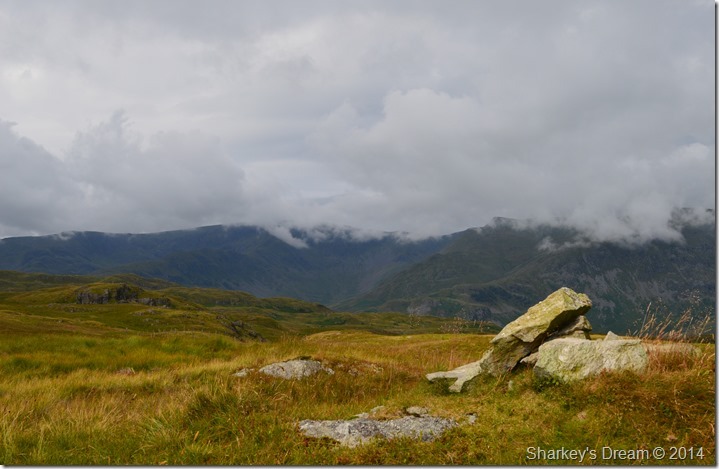 I left the farm track for a short cut towards the final shoulder of the summit that had been cut through a wide section of bracken where I soon spotted the stone cairn to my right as I climbed a little higher. 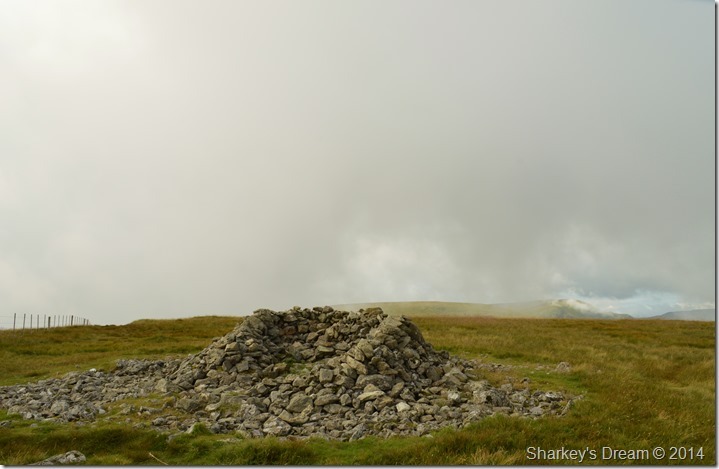 Scalebarrow Knott has a subsidiary summit with a cairn on each grassy top. Through the hill fog I soon spotted the main summit running south west from where I took this photo of a rather cloudy landscape & my ridge route ahead. As I left the summit my view gave me enough visibility to reveal two tracks that ran south west across the ridge, one of which looked more like a farmers quad bike had been put to use, the other track to my right ran besides a dry stone wall which I could clearly see on my map. Both tracks never ran more than thirty/forty feet apart so I guess it was up to the individual walker which one was used, however, seeing as the fells had just experienced a heavy night of rainfall I chose to give the farmers track a wide berth & stuck to the track besides the stone wall. Up ahead, my next summit of Harpers Hills. 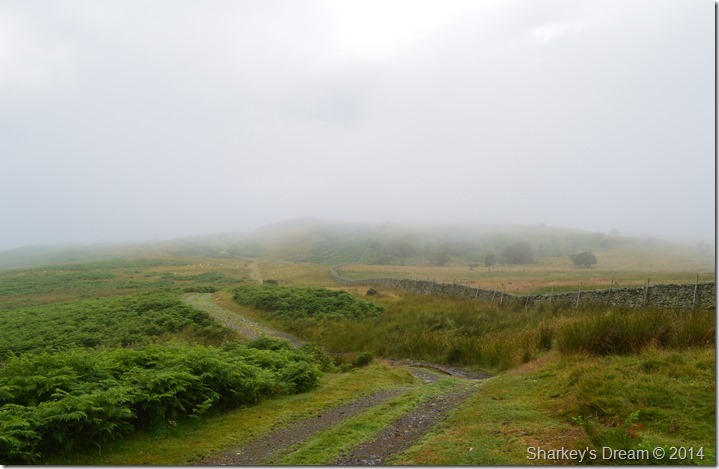 After leaving Scalebarrow Knott I followed the grassy path all the while keeping the stone wall to my right which can be a great navigational tool when walking in cloudy conditions. 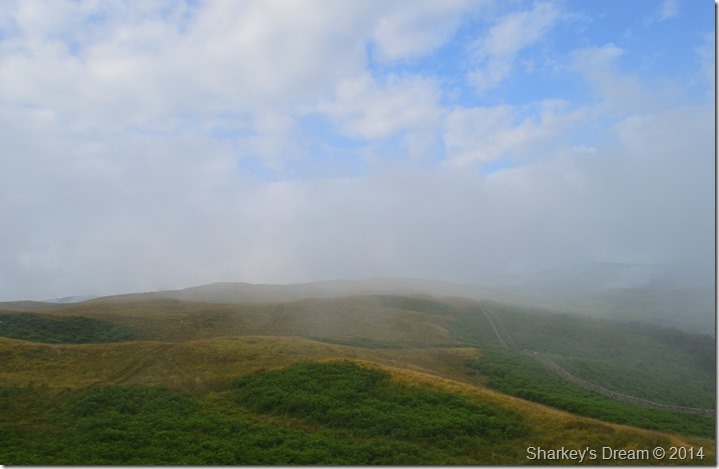 Glimpse’s of a blue sky threatened overhead but never amounted to much as the thick hill fog clung to the ridge & with no wind to move it along it suddenly dawned on me that I could indeed, be walking this whole route with almost no visibility at all. A slightly unimaginative photograph of Harper Hills summit cairn. The hill fog was still causing visibility havoc by the time I reached Harper Hills summit which was gained without much effort at all. The morning air was still & with no wind to carry it made for some extremely muggy conditions, by now I had only been walking for less than an hour when the thought came to mind that I wouldn’t mind that rain shower right about now. I circled the summit a while noting that the skies overhead & to the north where starting to clear rapidly with each second as more & more blue sky suddenly came into view. 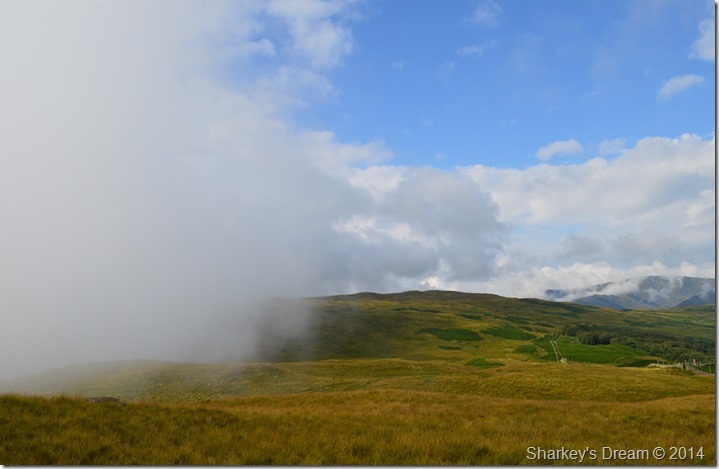 Moment by moment, second be second it was becoming more & more clear that I was about to witness one of those special moments as the cloud started to lift revealing a wonderful array of colour & wide open fellside. As the minutes passed the contours of the ridge ahead appeared. 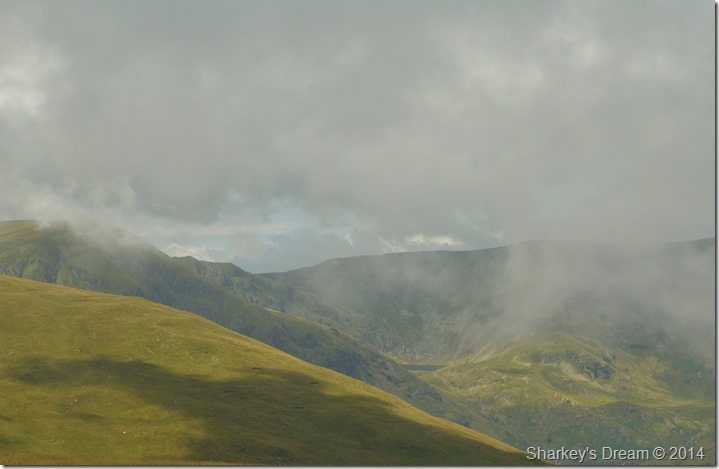 Further North West towards a Mardale skyline the cloud started to lift right before me. And within minutes the cloud had all but gone. With distant views now clearly visible I could set my sights on my next summit of Powley’s Hill which ran just south around three quarters of a mile up ahead. 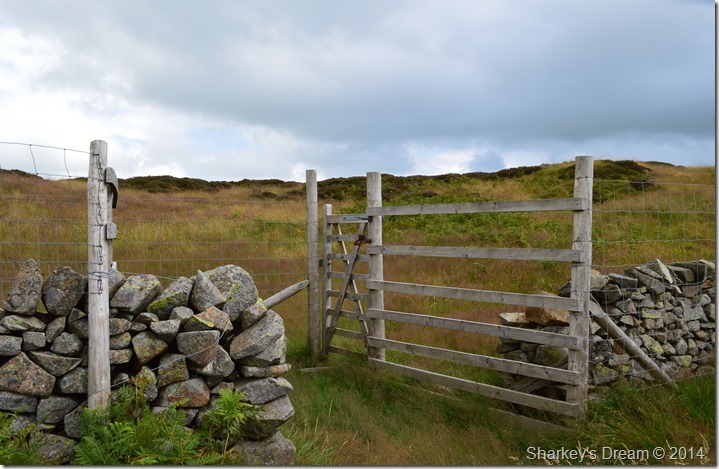 My path eases towards Powley’s Hill but then came back in on itself towards the stone wall once the the crest had been passed before descending slightly where the path again eases out over a grass plain. From here Powley’s Hill looks to be over the left shoulder but take care as looks can be deceiving, as the summit itself sits beyond several small grassy obstacles. A tip here is to look out for the newly planted trees on said false hills where Powley’s Hill sits just beyond, those with a keen eye may spot the stone cairn first. 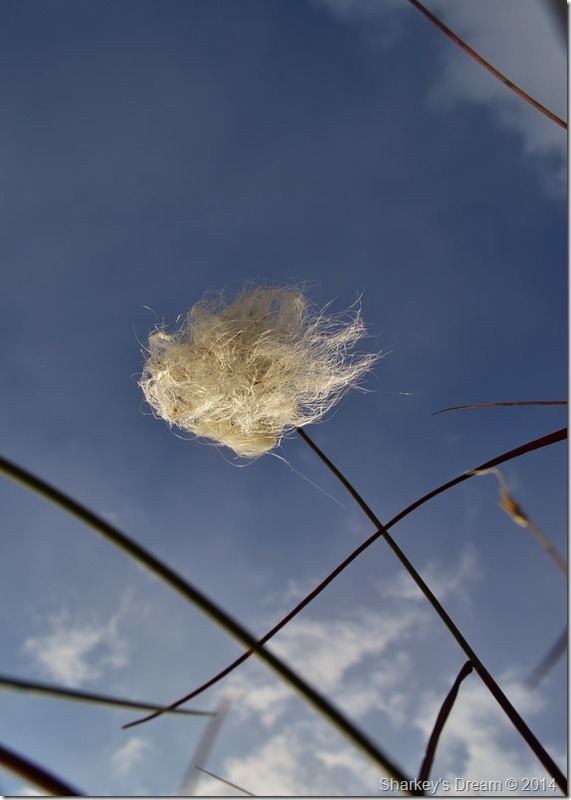 But first, a little more fun with the cloud. This time I feared my luck had ran out as I witnessed the cloud roll in from the direction of Swindale Head only for it to disband once it centred the ridge, the wind had almost died again & with nothing to ease the cloud along its way I again had the privilege to just stand & stare for a few moments, some of which made this early morning walk that little bit more rememberable. 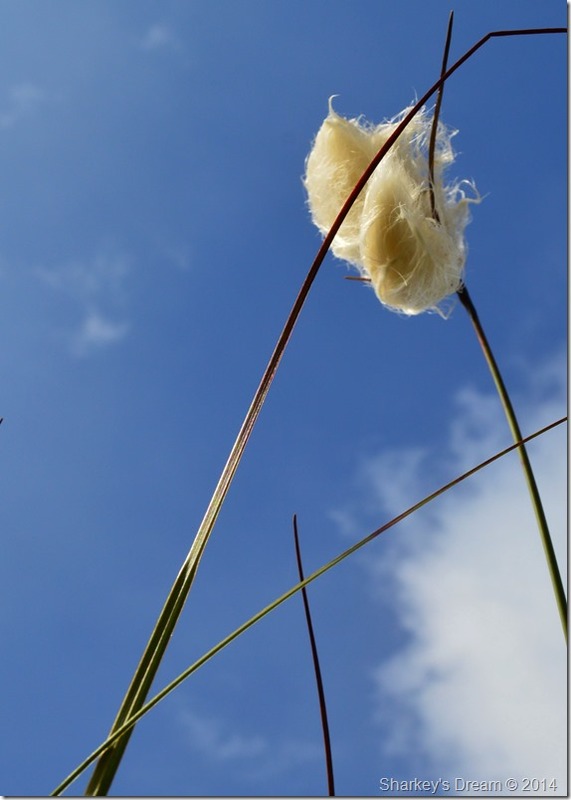 Set against a deep blue sky. I continued to follow the stone wall all the while making sure that Powley’s Hill (or thereabouts) was never far from sight, that was when I stumbled across an old chimney that at first I had mistaken for a possible stone survey pillar left behind from the days of Manchester Co-operation when constructing the Haweswater Dam project. The stone chimney deserved a closer look. The only thing stopping me getting a closer look at the chimney was a very tight chain/clasp on what looked to be a new wire fence seen here with a problematic gate, I struggled for a few moments before realising the only thing that was going to release that clasp was a pair of pliers of which now, were in short supply. 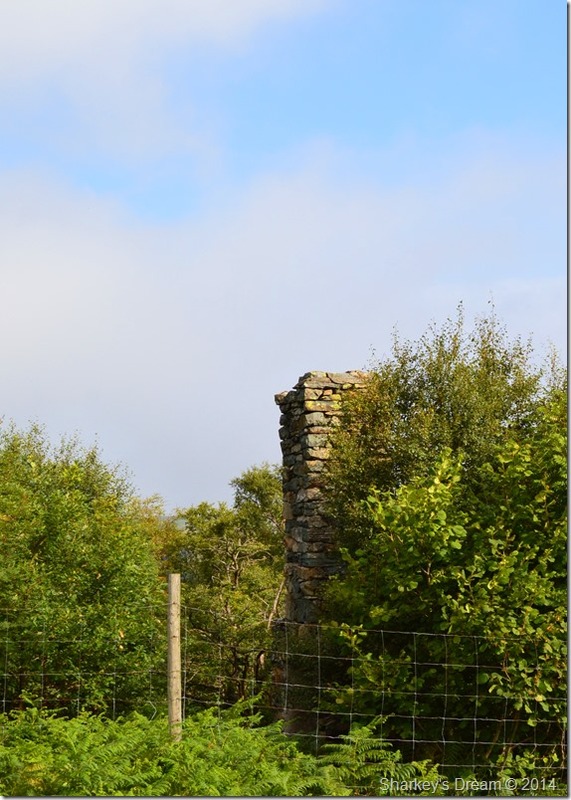 It is said that the stone chimney is all that remains of a stone hut that once stood here, which could have some connection with the Lowther chimney found on Loadpot Hill just a few miles away? I zoom in through the Deer Fence to try & get a closer look. One last look back at Harper Hills before I take a direct ascent on Powley’s Hill. I headed straight up the hillside seen in the right of the photo before taking on numerous false crest’s before finally spotting the stone cairn a little further ahead, this meant walking through deep grassy tussocks that zapped strength a little as by now, the morning sunshine had already started to heat up. I re-joined up with a faint path met with a sign in doing so for which I can only blame by eagerness to explore the ridge from width to width, from here it was just a few short steps before reaching the cairn. 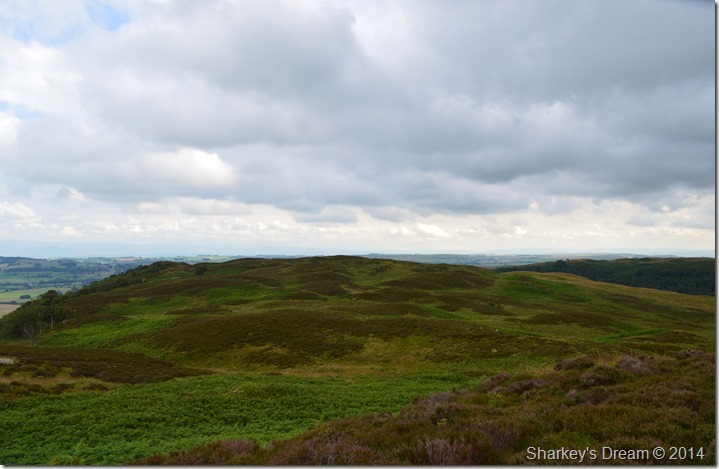 Selside Pike from Powley’s Hill stone cairn. The ridge ahead opened up once more briefly revealing Selside Pike before my whole view was lost once again as cloud steadily rolled in from Swindale Head. 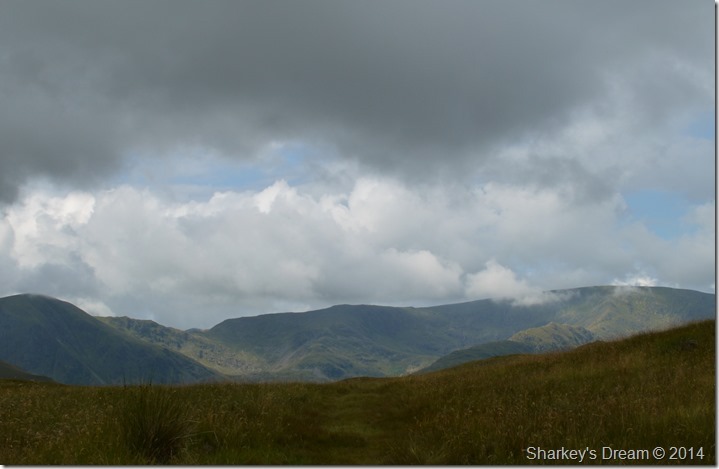 From here I could begin to make out the more favoured Far Eastern fells of Branstree & Harter Fell (Mardale). Every once in a while cloud would lift off my favourite of them all revealing High Street. I wondered just how many people the fell would see that day. Although I have to admit, I was pretty happy with my own route this morning. 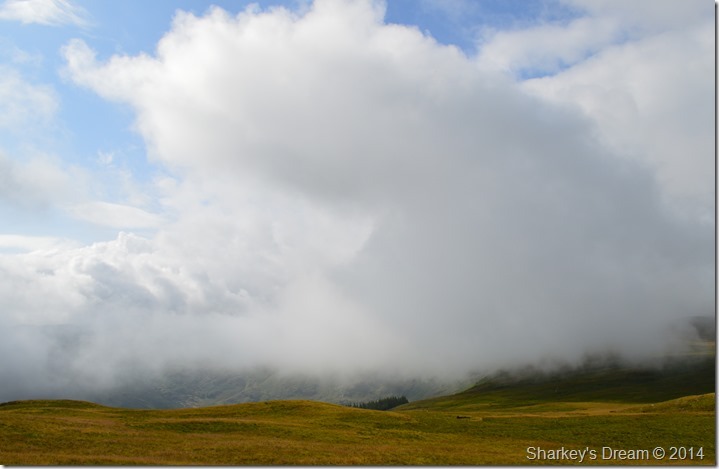 Swindale Head wasn’t revealing much with the exception of a beautiful cloud display. 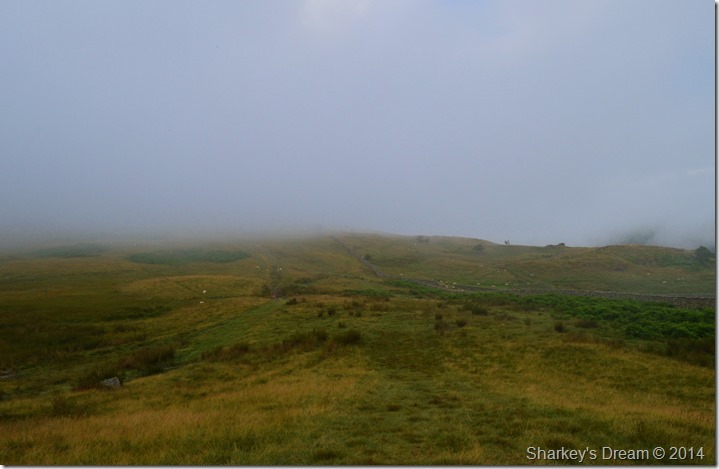 It was now time to take on the infamous Hare Shaw, an Outlying Fell sad to say, that I had yet to grace. Hare Shaw lied a little south west of Powley’s Hill & again can be deceiving set amongst the almost flat expanse of Swindale Common. 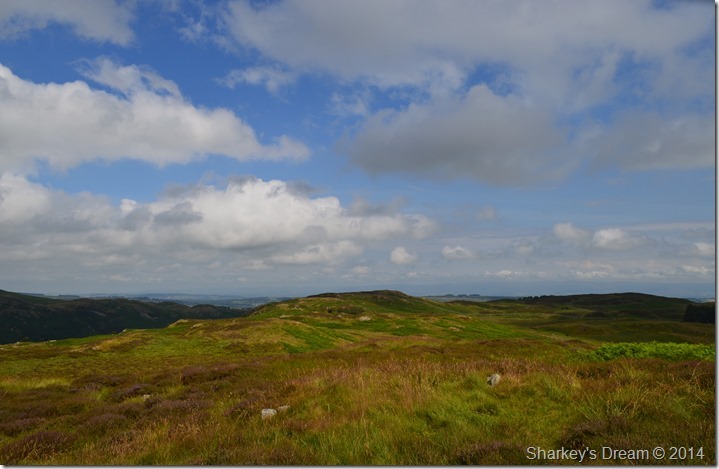 From Powley’s Hill I take in a faint path that would lead me oddly much further ahead towards The Mardale Corpse Road rather than Hare Shaw, so once again once beneath the grassy ridge like bank containing the summit I then left the path & bog trotted my way over. Distance travelled in between Powley’s Hill & Hare Share was less than half a mile yet in that time the weather had turned from the brilliance of bright blue to a more dull grey yet again. 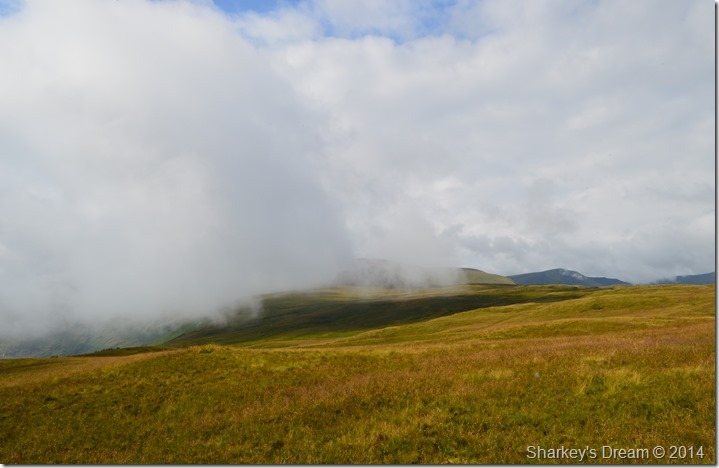 Beyond Mardale Head to my Eastern flanks the cloud had began to creep over the summit tops, I figured it wouldn’t be long until it was my turn as by now the cloud that would once quickly come & go from the direction of Swindale Head had now started to settle. Selside Pike, Branstree & Harter Fell (Mardale) taken from Hare Shaw summit cairn. A wooden stake marks a section of path along The Old Corpse Road. 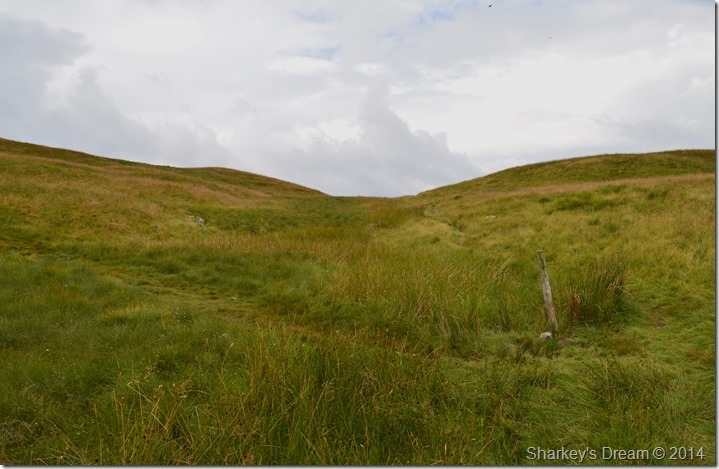 After leaving Hare Shaw behind I picked up a faint grassy path & headed for Selside End which is a subsidiary ridge of the summit of Selside Pike, at first I followed the path that first branched away from The Old Corpse Road before breaking away & heading for a view of Swindale Head. 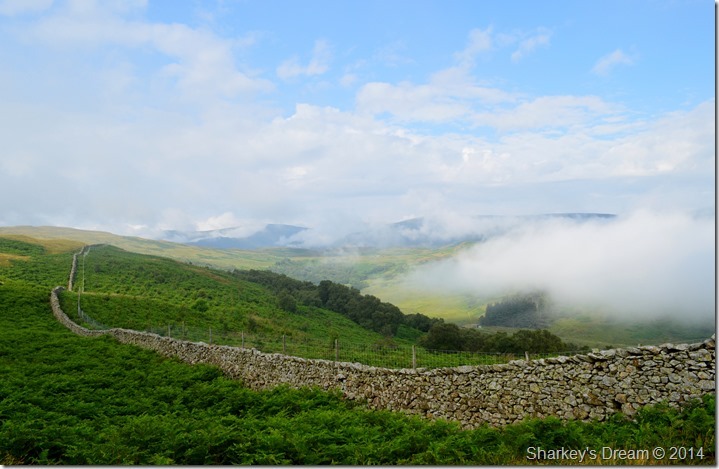 This was done quite easily across a pathless ascent until I crested the shoulder of Selside End where views would have opened up over Swindale Head, however, once there I soon realised my view was blocked by a bank of cloud that lingered around the head of the valley. I spied myself a sheep den that had been cut into the hillside some hundred yards ahead, getting there meant a short swift walk around a section the valley head. Seeing as I had a little time on my hands I soon headed over all the while being watched eagerly by a pair of Red Kites who circled & watched my every move. As I found a place to watch the Red Kites, & maybe with a bit of luck try to capture a photograph, I remember a section of Wainwrights Guidebook Two (Selside Pike 5) which mentioned that several ruined sheepfolds occupied the Swindale Head together with a slate cairn which is indeed true, on another note it is also rumoured to believe that there is also a ruined fox trap within the same area. As I set about the task of finding remains of the infamous fox trap I soon came across not one but two sheepfolds & indeed the slate cairn that where still in remarkably good condition, but sadly if the fox trap does remain the likelihood of finding it during the summer months when the bracken is high is going to be pretty difficult, even through the eyes of a pair of binoculars. I shall return come wintertime. The humidity hindered my Selside Pike ascent so much so I could literally ‘ring out’ the straps of my pack once I had arrived. Since my fell walking career began I had always carried a Carling Black Label bar towel that I can only imagine somehow found its way home with me one drunken evening during my teenage years. Today said towel was put to use for the first time, I couldn’t help but think that If I had a piece of kit that I never used & used up too much space that towel would be it. From now on however, I will try to keep at the top of my pack rather than the lower reaches when ones arm almost detaches when trying to resurface anything lower than elbow length – so much so I almost lost my watch in the chaos. But the old bar towel worked wonders in the end in keeping the sweat at bay! Beyond Branstree East ridge, Harter Fell (Mardale) Mardale lll Bell with a glimpse of Small Water. 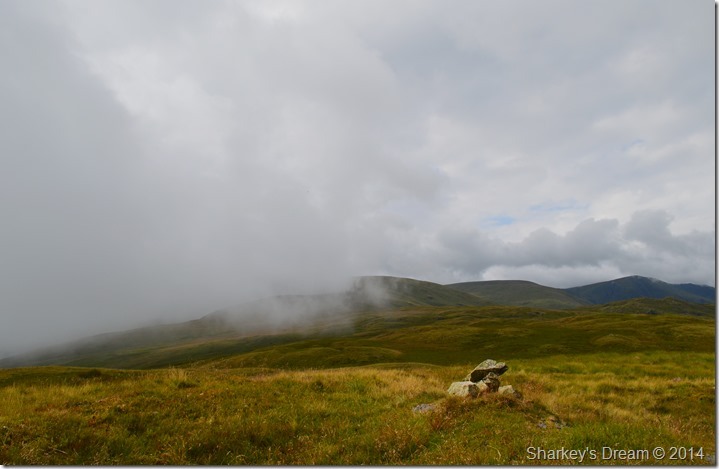 After spending a few moments resting up & degreasing at the summit shelter I left my pack to dry out a little while I had a wander west of the shelter to a subsidiary stone cairn that over looked Mardale Head, however, here my views where hampered by the presence of more cloud that rolled in over the Mardale Head & its satellite fells. I soon retraced my steps back to the summit shelter after realising that the cloud was advancing much more quickly than it had whilst on the lower slopes of Harper Hill’s, here I shoulder back & being my descent back to The Old Corpse Road much the same way I had ascended minutes earlier only this time I took the fine route from a much higher level so I could once again take in the delights of Swindale Head. The Swindale Valley from Swindale Head. 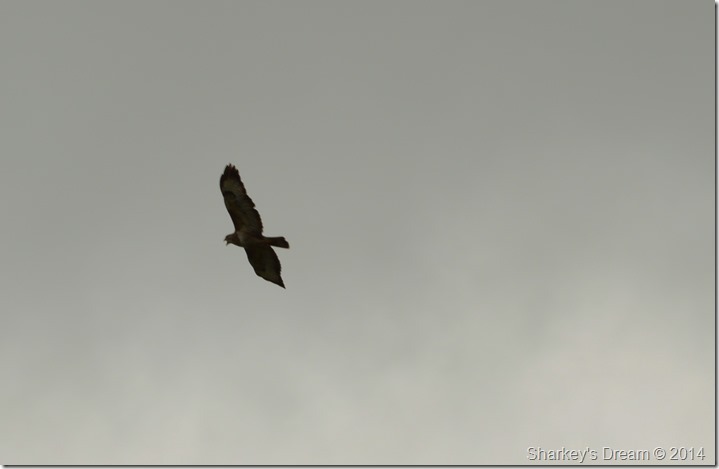 The cloud toyed with my efforts & so did the Red Kites who once again swooped on my position never letting me forget that I was in forbidden territory with more squawks & ritual circulating overhead. Just as the most of the cloud had left the ridge I managed to take one clearer but not altogether focused photo of Swindale from Swindale Head, I’m guessing the Red Kites & their swoops made me a little jittery after feeling very much unwanted. Mardale Head summit tops taken from The Old Corpse Road. After leaving Selside End behind I re-joined The Old Corpse Road back at the wooden stake where I took a left turn to take a walk through time. 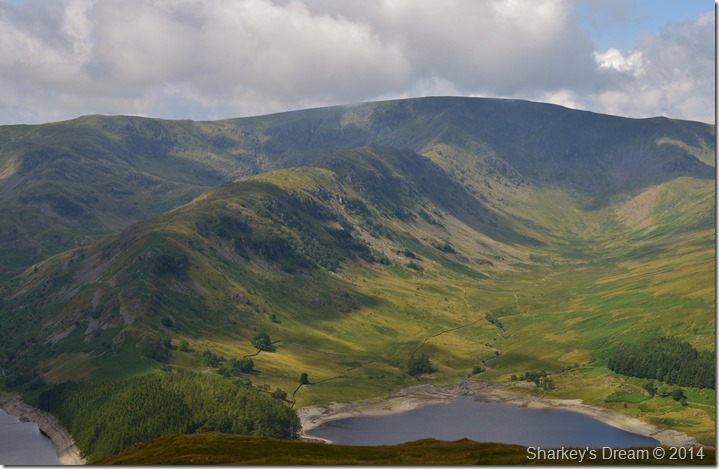 I have always been pretty infatuated with the Corpse Road’s of Lakeland & none more so than The Mardale Corpse Road which was just that…a route used to transport the deceased to Consecrated ground by means of walking. 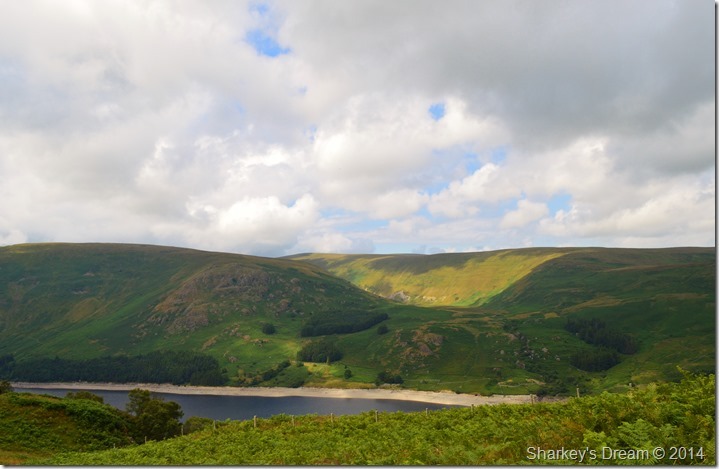 Although the Valley of Mardale did have its own church, it was only up until the 1700s where the people of Mardale where allowed to bury its own at its Church Cemetery. Before all that the corpse’s of the deceased were carried along what we all know as The Mardale Corpse Road & down into the next Valley of Swindale, but the journey for the deceased didn’t end there as a further trek over somewhat easier ground had to be made where the dead were finally given a burial at Shap Church. Later during the construction of the Haweswater Dam project the body’s that did finally get a burial at the minuscule Mardale church had to be exhumed & re-buried once more at Shap Church where a special corner of the grave yard was set aside next to the train line. The last body to be carried to Shap by the Corpse Road was that of John Holme on 17 June, 1736. From my descent of Selside End I spotted my next intended target, that of the Rowantreethwaite Cairn which forms a grassy platform above Brown Howe. 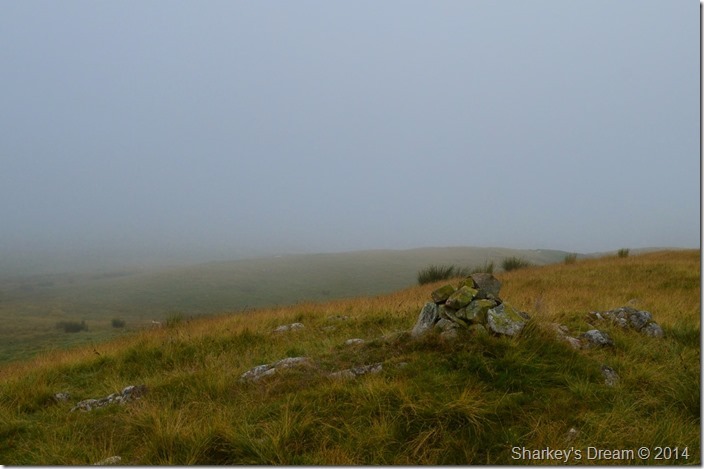 My views were quite clear & although from my distance I couldn’t see Rowantreethwaite Cairn, I still could see the exact point where I needed to leave The Corpse Road to reach it. 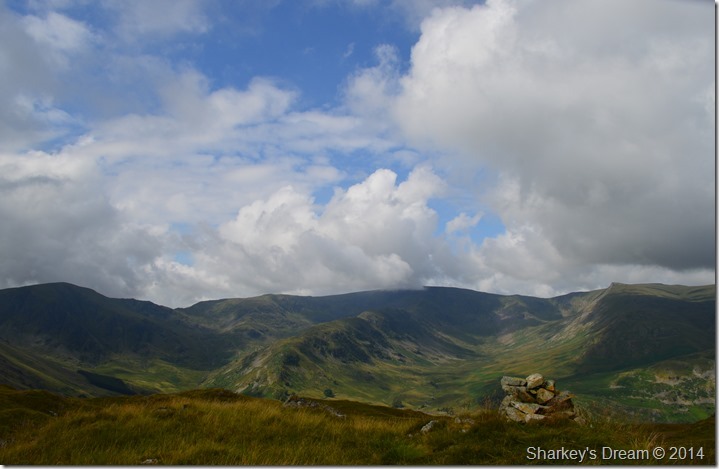 Harter Fell & High Street’s Rough Crag ridge dominates Mardale Head. 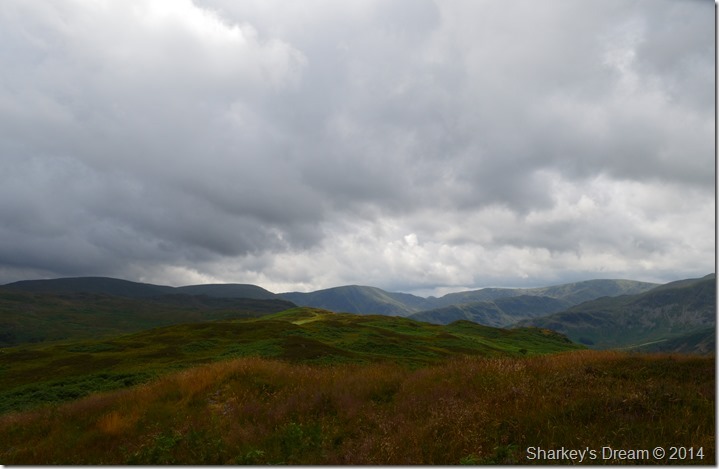 I soon reached the point where I knew I had to leave The Corpse Road behind, here I absconded over wet bog to reach a null where two grassy summits present themselves as both powerful purchases with views over Mardale. 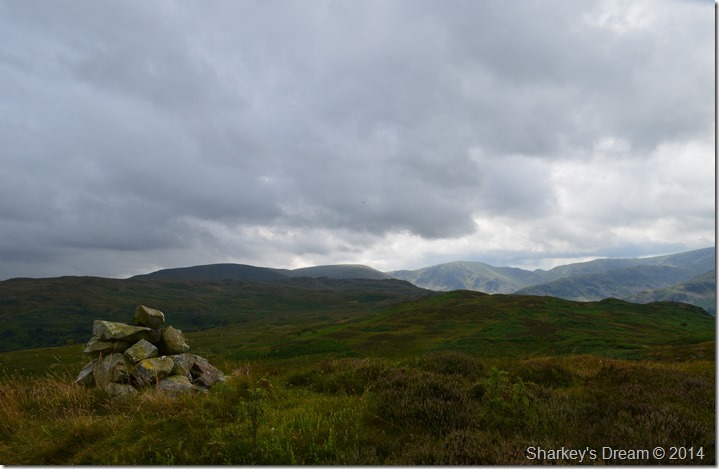 I could now see the Rowantreethwaite Cairn which lay behind my left shoulder as I made my way towards the smaller of the two summits, the one I deemed to have the best view of Mardale Head from noticing all the while much like the previous summer that Haweswater looked low once again. Should I have had more time to explore my ground & indeed, more time today on The Old Corpse Road I’m sure I would have found that perfect view of Mardale Head but sadly I just didn’t have the time to go off exploring, that isn’t to say that I wasn’t already pleased with my results from beneath Rowantreethwaite Cairn. A close up of The Rigg, Rough Crag, High Street & Riggindale. Harter Fell (Mardale) Mardale Ill Bell, High Street & Kidsty Pike from Rowantreethwaite Cairn. 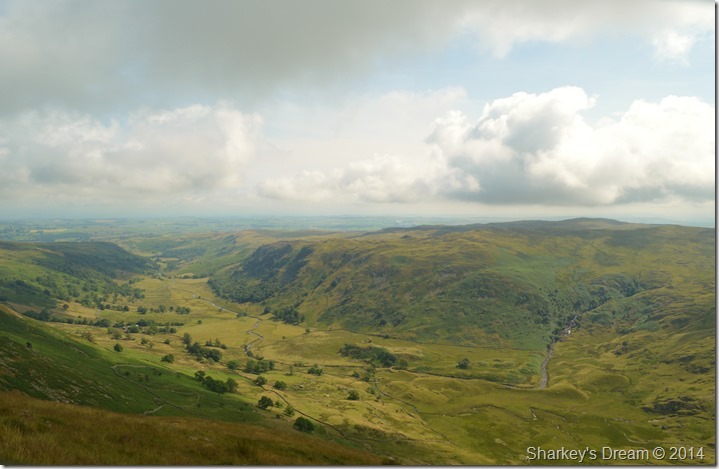 The Naddle Valley from Rowantreethwaite Cairn. I was roughly at my half way point by the time I reached Rowantreethwaite Cairn which meant I had a good view of almost my route back along the Naddle Valley & its summit tops that I had yet to claim. As I did, it’s worth to take time out from this lofty summit to plot your route because once down in the valley itself you are almost instantly surrounded by small grassy peaks that block out views in almost every direction. My aim was to reach an outpost within the valley named Aaron’s Bield which is marked as an old sheepfold situated besides Guerness Gill which can be seen in this photo where the lone tree stands just left of the stone summit cairn far into the valley. At first I gave thought to make a crows eyes descent but quickly changed my mind once I tested said route where I found the ground impossibly boggy even after long periods without rain. Instead I climbed high towards the western flank of the ridge where I could keep my feet dry while at the same time keep an eye on my route ahead which I found worked really well on both parts. 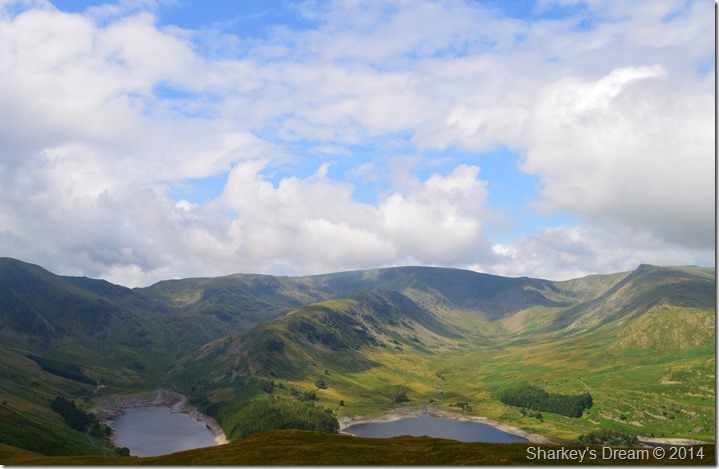 Haweswater seen with Measand End from as I head for Aaron’s Bield. My plan to keep high kept my boots dry & worked really well with navigation, from Aaron’s Bield I could still see the tree that I had spotted from Rowantreethwaite Cairn, seen here besides an infant Guerness Gill. Ascent on High Naddle Forest. After crossing Guerness Gill by means of a few carefully placed stepping stones I had the pleasantest of walks via a stone wall where up ahead I came to a T Junction with another stone wall, at the junction I had no choice to climb over the wall firstly committing by throwing my pack over first. I climbed the stone wall & jumped down the other side although I had that niggling ‘was I trespassing’ thought that crossed my mind, however, from the height of the wall I could clearly see a route cut through first grass then bracken that would lead me all the way towards High Naddle High summit. Wallow Crag taken from High Naddle Forest summit. The afternoon heat was bearing down on me by the time I reached High Naddle Forest summit, so much so I had to stop for a quick breather yards from the summit if only to regain a little strength back. 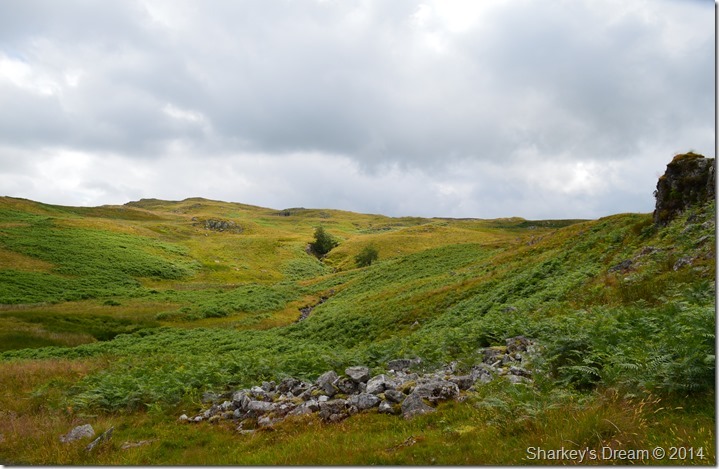 From High Naddle Forest summit Wallow Crag struck out along the ridge, my only issue was that once more I would have to traverse my own way over as by the looks of things the wild heather & bracken had taken over any distinguished path. 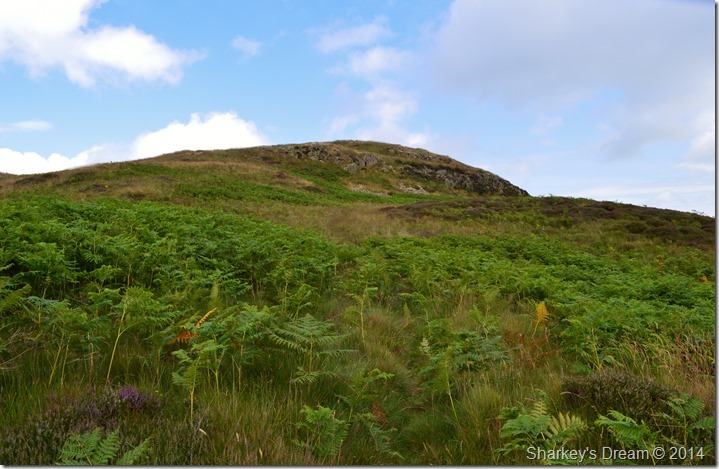 However, the thoughts of trailing through thigh high bracken where soon laid to rest once I left the summit behind where I managed to pick up a faint narrow path here the heather & bracken gave way just enough to blaze my route over towards Wallow Crag. With views over towards Measand End & Low Cop which has a glistening of sunshine across its ridge. Here, looking back along the Naddle Forest ridge. In this photo you can see that the weather is starting to close in from the South West which by the looks of things was starting to claim my previous summit of Selside Pike seen far left with Rowantreethwaite Cairn now seen, as a faint outline in the foreground. I didn’t quite know due to the total lack of wind how long I had before the dark cloud & its contents would catch up with me but I figured I had enough time to complete my walk. 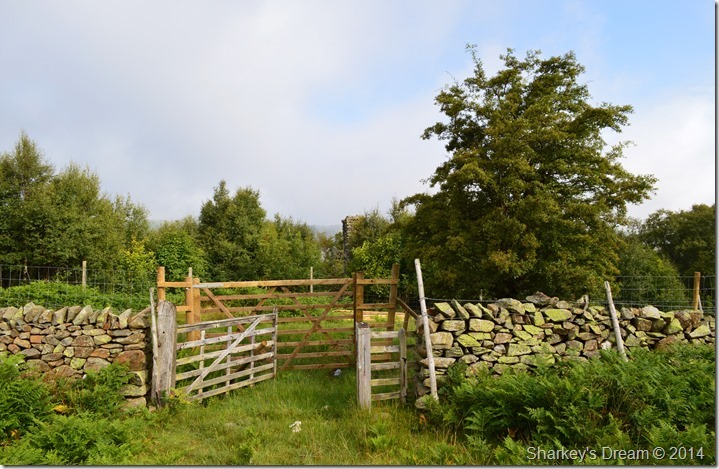 Passing through more Deer Fences along my way towards Wallow Crag. Selside Pike, Branstree, Harter Fell, Mardale Ill Bell & Rough Crag seen from Wallow Crag. After passing through the Deer Fence Wallow Crag was soon reached without much effort at all. 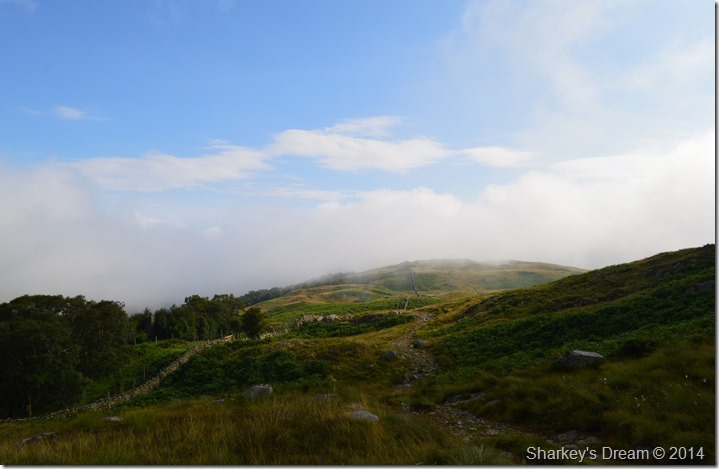 By now however the cloud above was starting to thicken as tired legs started to kick in from my efforts through bracken that was at times, shoulder height. In terms of knowing what time it was I guess I had been enjoying myself far too much to realise that I had skipped lunch by a good hour, it was only until I took a rest at the cairn on Wallow Crag did I start to hear the stomach growls erupting telling me it needed feeding. I span around & looked across to what would be my final summit of the day that bared the rather unusual name of Hugh’s Laithes Pike before turning around again to guesstimate what time that dark cloud would arrive right above my head. Should I go for it or not I muttered. 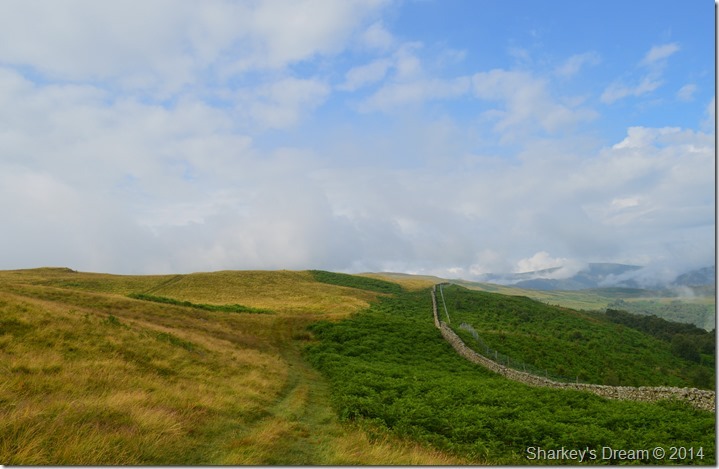 Hugh’s Laithes Pike…a fell too far? 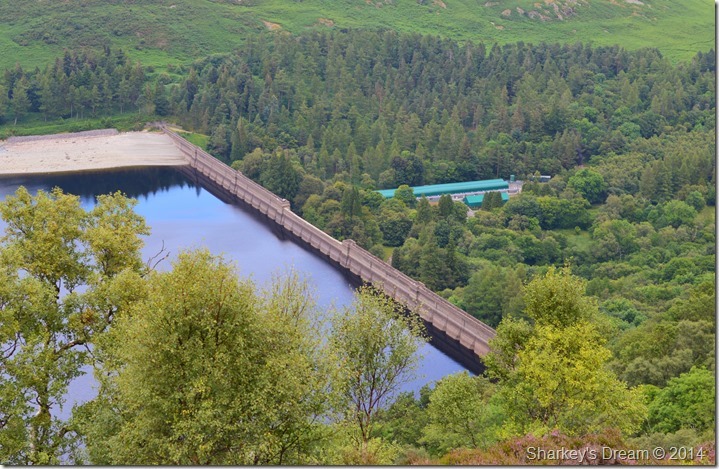 Haweswater Dam seen from Hugh’s Laithes summit. Haweswater Dam seen with the hamlet of Burnbanks in the right of the photo. The larger of the bungalows where occupied by senior staff & management who later moved on after completion of the Dam. Now Burnbanks by generations of the families who took over after the workforce left, most of whom have lived there ever since. 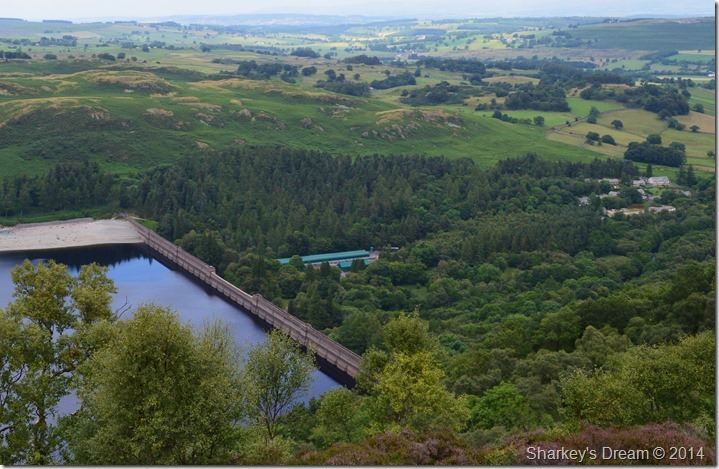 Lets never forget that the hamlet Burnbanks would never exist if the Village of Mardale never gave way for Manchester Cooperation so that the City of Manchester could have clean drinking water for which the residents of Burnbanks are eternally grateful. 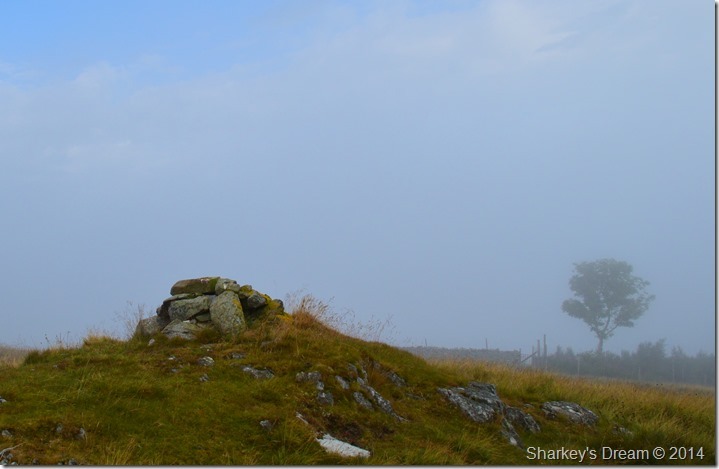 After spending time at Hugh’s Laithes cairn I soon realised that I had ‘that cloud’ to contend & indeed, race with. I made a crows eyes descent via a large wooded area that engulfed the fellside common to the flanks that make up Naddle Forest. Here sheep & cattle were taking the last advantages of sunlight as the cloud cover increased turning everything a murky grey behind me. As I took in the last descent towards Naddle Farm spots of light rain, every now & again, left blotches on my exposed skin. At times I had to question was it really starting to rain or could it be the dribble dripping from my mouth as it cried out for food, it seemed that I had yet again forgotten to feed myself through the run of enjoying ones self. As I entered Naddle Farm I soon spotted the sign post for Swindale via a crossing over an almost bone dry Naddle Beck. From here I had my last ascent of the afternoon to deal with which looks a little more punishing on the map that it did underfoot. I climbed through the woodland as the rain hadn’t really took hold just yet, only the odd spot on the arms and forehead was evidence of what was to come. I continued with my climb. After leaving the woods behind, the path crested out to a more easier level underfoot & I was back in wide open fell scape. Scalebarrow Knott was just ahead beyond a gate which I must have past that morning but didn’t remember seeing. I passed through the gate as the drips turned to a more sustained drizzle, there was absolutely no way I was reaching for the jacket – not half a mile from the car. 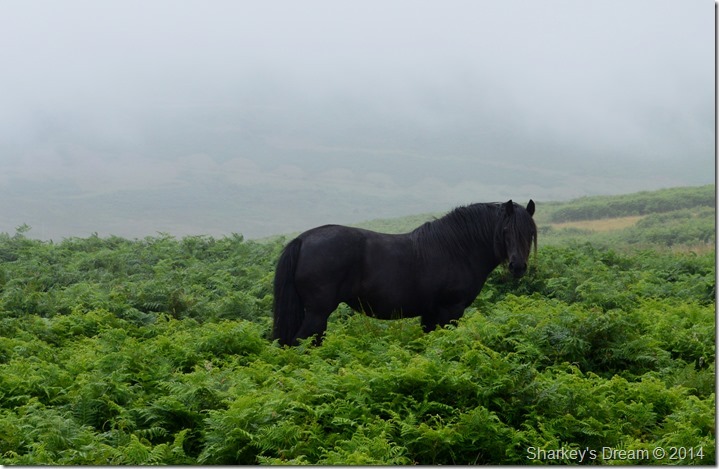 I shouldered Scalebarrow Knott without giving it a summit, the two fell ponies from this morning had only moved what seemed like ten feet where they must have stayed for the duration of the day as the rain started to take hold. I suddenly had a sinking feeling like my stomach was in knots which could have been telling me that I was running on absolute empty & was begging for me to feed it, but, I liked to think that the reason my stomach was in knots was because an absolute terrific walk in uncharted ground, had now come to an end.